It’s all about your personal choice. Whether it is glitz and glamour you want or basic elegance, we are here to help assist you in making that selection. Custom Backdrops, Boxwood Hedge Backdrops, Ceiling Decorations, Lighting, and more. We offer designs to make your wedding or event feel like a dream come true! We know how important your design is to you! It’s all about the budget…..
You know what you have to spend. So whether you are “shooting for the moon” or “being very conservative”, we are here to help you figure it out and meet your budget! You wouldn’t buy a house or car before you personally inspected. So why would you select your wedding or event rentals without personally viewing. 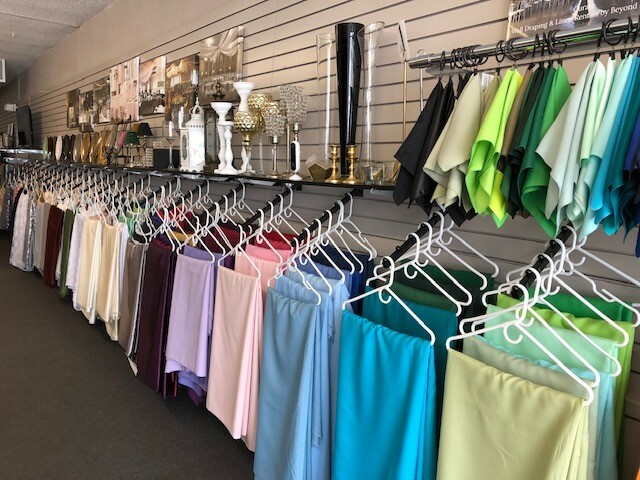 At Beyond Elegance we open our showroom full of tablecloths, napkins, table runners, overlays, chair covers, chair sashes, chairs and more for you to personally come setup a table and personally see your tablescaping before your wedding. Don’t stress over wondering what it might be. Come see what it “can be”! Visit our Showroom – just Book An Appointment. Not local to our area….just E-mail or Call Us Now! We love talking to our customers!